I once played in a professional soccer game against Maradona's team from Argentina. This section will continue to evolve as I go back to the archives and ferret out photos of me having adventures in different places around the world. This means that I'm looking through physical photographs and slides, because most of the cool stuff happened before digital cameras came out. Unfortunately, I was alone on most of my trips, so I have relatively few photos of all the places I visited. For instance, I spent a lot of time in Archangel, Russia and I haven't found a single photo of me there, which is a shame. In the meantime, I've thrown in a few photos I just happened to have on filed away on my iMac. Jungle rivers play a big part in the Avery McShane books. 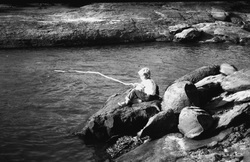 Here I am in a photo from the mid-60's, fishing. By this time, I was pretty savvy about what could be in that water: anacondas, gators, piranhas and all kinds of things. I usually fished and explored while the adults would pan for diamonds along the river banks - and they found diamonds! I'm wearing my usual, too: rolled up jeans, canvas sneakers and a white t-shirt that rarely stayed white very long. I should point out that the river is low. When the tropical storms start up during the rainy season, the river turns into a churning chocolate-colored flood ripping away huge jungle trees and rolling boulders the size of trucks. Not a good time to fish. For many years, before and after the boys were born, Jeanie and I traveled to Belize. The English-speaking country had everything we looked for, and nothing we didn't want: deep-sea diving, big fishing, sand, the world's second longest coral reef. All that, and it was only a few hours away by plane. Jeanie and I first started going with the more colorful members of Houston United Soccer Club. Ex-British military officers, Hungarians who escaped the German and Soviet invasions - maybe even one or two of those same invading Germans - crazy Greeks, and a smattering of Latin Americans, including me. Very late one night, just before a big soccer match with the best team in that country, I smashed my toe on a cement sarcophagus that had been exposed near the beach by the latest hurricane . I nearly ripped off the whole toe. It was broken and the nail is probably still stuck in the cemetery. Fortunately, I had pretty much anesthesized my body with beer and rum punch by that time, so I didn't fuss much. The next day, I played in the match anyway. The inside of my soccer shoe looked like a bucket of chum after the game - a combination of sweat and blood and pieces of toe . We won and I scored the winning goal. Good times. We still own some beach-front land on Ambergris Key. I was a geologist and oil man before taking up the pen to be a writer. I traveled all over the world. At the beginning of my career I spent a lot of time on drilling rigs as a well-site geologist. I would be there to check out all the bits and pieces of rock that would come to the surface when the drill bit was turning, thousands of feet below the surface. I would be looking for signs of oil or gas. I used a microscope and special instruments. Later in my business career, I spent more time helping investors find good deals. 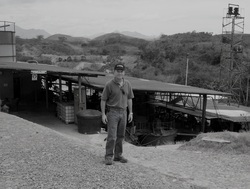 That's what I was doing in the gold mining district of Ecuador. 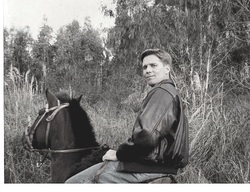 I loved this particular trip because I got to visit friends in Quito, where I lived from 1970 to 1975. This photo was taken near the scene of a tragedy that received world-wide coverage in 2010. There was a period where I worked with a Danish shipping company that chartered special ships to move oil field equipment all over the world. The travelling alone made that job worth it. 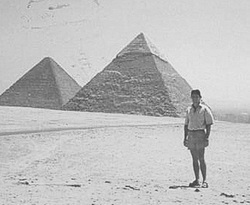 I made several trips to North Africa to supervise the unloading of our ships and to drum up new business. My favorite trips were the ones to the Port of Alexandria. I am a big history buff, and it doesn't get more historical than the ancient city of Alexandria, the Pyramids and the ruins along the Nile River. I remember this particular trip. I hired a car and went into the back country, away from the well-traveled places. I ate roasted pigeon at a road side stand and I bought a very old carpet that still had desert sand in it. It had been used for decades by wandering nomads, and even had holes in it where they placed their tent poles. 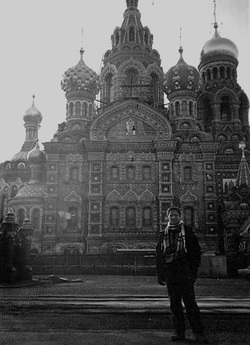 I have lots of stories about my travels in Russia. There was the time the ancient Aeroflot plane I flew to Archangel got caught in a huge winter storm - almost ripping the plane in two - and was diverted to Murmansk. And then there was the time a Georgian mafia goon put a .45 to my head in an apartment in Rostov-on-Don. I even experienced a classic, middle-of-the-night scene right out of Gorky Park. In St. Petersburg I had to stay on ships that had been converted to hotels, because it was safer than the ones in downtown. This was in the early 90's, and Russia was just getting over being the USSR. In Moscow on one trip, I stayed at one the largest hotels in the country. My room overlooked Red Square and St. Basil's Cathedral. Each hall had two armed military guards. They carried sub-machine guns slung on their shoulders. Those same two tried to get into my room at around three in the morning. I heard them whispering and saw the door handle turn. I sneaked over with a chair and wedged it under the door handle. They went away, but I didn't sleep a wink after, and I stayed at the Radisson the next night. I will write about these experiences some day, so I won't go into details on these incidents, and I'll keep the other adventures to myself until I get around to putting it all into words. I had been traveling on business to Argentina for several years, when I was hired to manage the oil and gas assets of a large Argentine conglomerate. I was the only non-Argentine out of a couple thousand employees. Jeanie, my two young sons and I lived in a nice house in the suburbs of Buenos Aires. I will also be writing about adventures in Argentina, so I won't let the cat out of the bag right now. Speaking of cats, we stayed with a loose mountain lion in our room at a ranch in El Tigre, which is sort of ironic because El Tigre translates to 'The Tiger" in English. We also traveled to the southern-most city in the world, Ushuaia, where we boated down the Beagle Channel. This trip to the Tierra del Fuego region of Argentina left a big impression on me. It was unlike any place I'd ever seen, and I could almost feel what Darwin felt when he sailed through those many decades ago. The place features prominently in my latest book, and it probably won't be the last time I includ it in my writing. Of course there were lots of other places we went to: Mar del Plata, Mendoza, San Miguel del Monte, and Iguazu Falls to mention a few. Actually, it was my wife, Jeanie - a very accomplished nature photographer - who went to the falls with a German friend. Her photographs of that wondrous place inspired me to start a new adventure project called, The Pirates of Xingu.